Nina was born as Ana Maria Agusti Flores in Barcelona on October 1, 1966. Her music career started in the Eighties in bands like Costa Brava and Xavier Cugat. 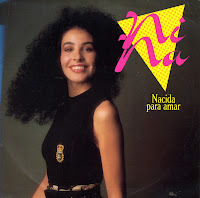 In 1989 she represented her country Spain with this song, 'Nacida para amar' ('Born to love'), a beautiful ballad composed by Juan Carlos Calderón. That same year, she released her debut solo album 'Una mujer como yo'. The song finished sixth in the contest, but the beautiful Nina always stuck in my mind. I bought a compilation cd of the 1989 Eurovision Song Contest in Switzerland that year, and this single appeared in my collection in 1998.